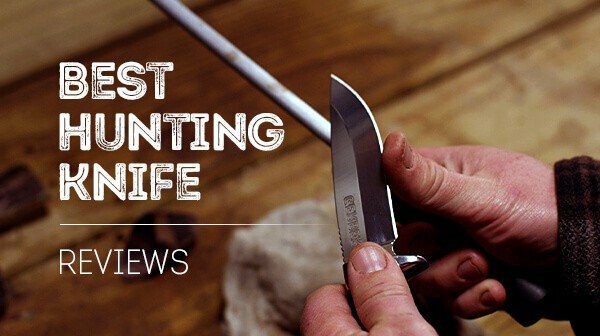 To help you navigate the vast world of hunting knives, we’ve put together a guide to the best hunting knife in the world. Not only have we reviewed nearly three dozen hunting knives for you to feast your eyes on, but we’ve also taken an in-depth look at some of the makers of the top hunting knives. And just in case you can’t find the right hunting knife among the large selection of best hunting knife reviews﻿﻿﻿﻿﻿﻿ we’ve got for you, we’ve also provided you with all the information you need to judge the worth of these top rated ﻿hunting knives and whether it can hold up to how you’ll use it. 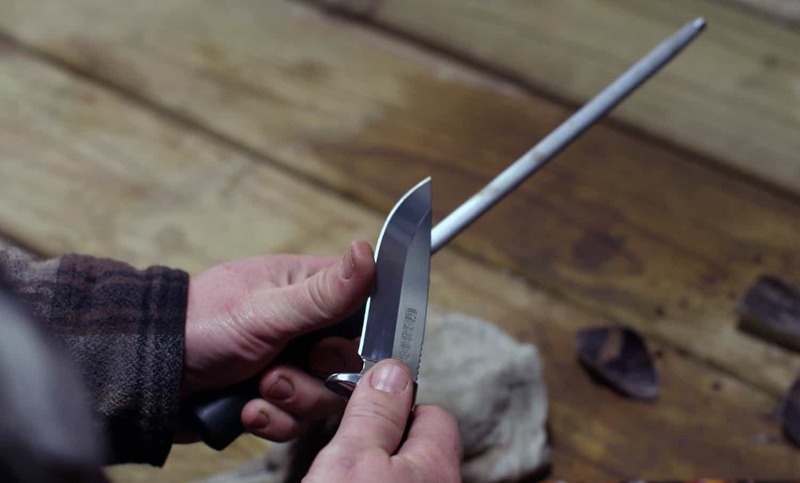 We’ve taken a look at the various materials available for hunting knife handles and hunting knife blades, pointing out their strengths and weakness. From there, we discuss the virtues of some of the best rated hunting knife designs and what their intended use is. But in case that isn’t enough, we’re going to wrap up with a look at some of the top hunting ﻿﻿﻿knife sharpener﻿﻿﻿s so you can keep your new hunting knife in good working order. 8 Which is the Best Hunting Knife? As mentioned earlier, we’ve got nearly three dozen different hunting knife reviews for you to check out. These knives exhibit a variety of designs, uses, price points, and materials so you can get a better idea of what you truly need a knife. Hopefully, we’ll give you an idea for your next hunting knife purchase, too. 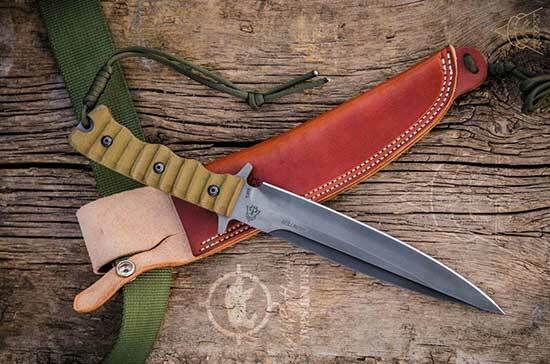 When it came to selecting the best hunting knife, there was some pretty steep competition. We looked at dozens of knives - many of which were not included in this review- and consulted the wisdom of people who have firsthand experience with these knives out in the field. 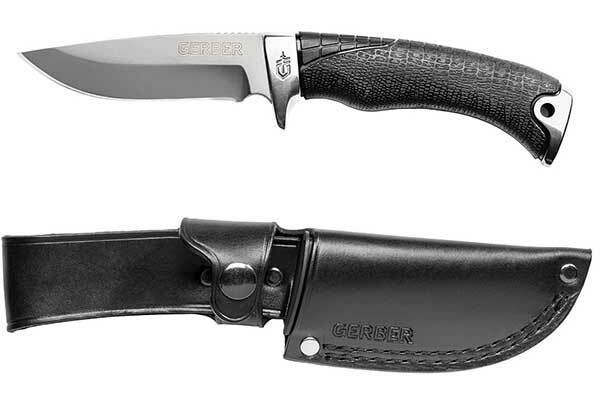 In the end, the combination of surprising quality, outstanding opinion by real owners, and price point made it easy to choose the Gator Premium Fixed Blade Hunting Knife by Gerber as the top rated hunting knife. This fixed hunting knife is available as an all-purpose hunting knife and with a gut hook. These are virtually identical except the gut hook and a slightly deeper belly on the gut hook hunting knife due to the extra upsweep to accommodate the gut hook. The blade is 4 inches long and made of CPM-S30V, an American made steel that was specifically created for use in knife making. This steel is sturdy, durable, has excellent edge retention, is highly resistant to corrosion, yet it sharpens easily. These are great qualities to have in a knife blade yet this steel isn’t as common as, say, 440 steel or 420 steel, as it does cost more to produce. This knife is a drop point full tang blade with a clean sweeping edge that gives plenty of bellies to make for a good skinning knife, but not so much that you couldn’t use this as a caping knife or for boning fish. The spine has jimping just before the guard to provide greater control for finer tasks. The guard itself extends low to keep your fingers from slipping forward to the blade edge. This makes it possibly the best fixed blade hunting knife for heavy tasks as you can work comfortably with it barehanded or with gloves and not be slowed down. Small details like that really contribute to not just the functionality of the knife but how well you enjoy using it, too, which is why this is the best fixed blade hunting knife for the money. The rear bolster matches the guard and has a lanyard hole. The handle features a dropped heel and forefinger groove to make for an even surer grip. It weighs 6.9 ounces and comes with a leather sheath. This knife is also made in Portland, OR. 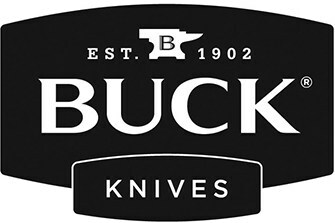 Buck knives have a long history of knife making and continue to manufacture knives with the same care and attention to detail as when they first began. This Vanguard by Buck Knives is a fixed blade hunting knife with a hidden tang. It measures 8 ½ inches long and weighs 6.3 ounces. The blade is made of 420 HC steel. This is a high carbon version of the commonly used 420 stainless steel. It contains higher amounts of carbon that render it stronger and less susceptible to wear resistance. This type of steel also contains higher amounts of chromium which improve upon the blades resistance to corrosion. Buck Knives also has a unique heat tempering process that further enhances the strength of this blade. The result is a far higher quality blade than comparable knives that also use 420 HC steel. As this is a very durable blade and has excellent edge retention, it is harder to sharpen than a softer steel. The blade is drop point, hollow ground, and has a good thick spine on it that further increases the blade strength. The blade edge is smooth with a gentle sweep that maximizes the blade edge and width to give a slightly longer stroke. It is 4 1/8 inches long. The handle is made of heritage walnut Dymondwood, which is a stabilized wood that is more durable than hardwood alone and is better able to withstand high humidity and wet conditions. This hunting knife has a polished brass guard with larger forefinger quillon and polished brass pommel. There is no lanyard hole. This American made hunting knife is built to last but comes with a lifetime warranty, too. It also comes with a leather sheath with a snap button closure and belt loop. Please note that the sheath is made in Mexico. See more of these Vanguard hunting knives... Click here. Bowie hunting knives have a strong American flavor as they were the knife of choice throughout the rugged wilderness of the West during the 1800’s. True to form, the Colt Bowie Hunting Knife strikes a good balance between size and weight, with a total length of 12 ¾ inches. The blade is made of 440A high carbon stainless steel. This type of steel is relatively common for hunting knife blades as it has fairly good edge retention, corrosion resistance, and it’s quite easy to sharpen, too. The blade measures 7 ¾ inches long, 1 ¾ inches at its widest, and 3/16 of an inch thick. The blade is touch heavier than the handle, with the balance point being about ¼ of an inch before the guard. The blade has a full tang and a swaged clipped point that extends more than half way back across the spine. The edge is clean and straight. It has a large “S” curved brass guard with a star embossed on the sides of the rounded ends. The handle is 5 inches long and has a dropped heel to fit more comfortably in your hand. There is also a light finger groove behind the guard and a lanyard hole in the heel. The handle is comprised of six hardwood scales with brass spacers and pins. It comes with a leather sheath that has a belt loop and leather straps to tie the end of the sheath about your thigh. 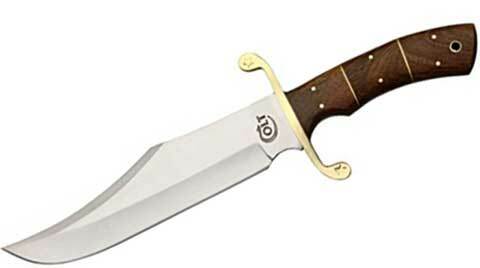 Find out more about the Colt Bowie Hunting Knife. Click here. The V﻿﻿antag﻿﻿e ﻿﻿﻿Force Serrated F﻿﻿olding Knife is a good-sized folding knife that measures about 7 ½ inches long when opened and it weighs 4.3 ounces. The blade is 3 ¼ inches long with a drop point and is serrated along the first third of the blade edge. This serrated hunting knife has an advantage over other hunting knives as it can functionally handle greater tasks. The blade is made of 420 HC -a high carbon variant of 420 steel that is durable, highly resistant to corrosion, and holds an edge well. The tradeoff here, as it is a stronger steel, is that it is somewhat harder to sharpen. The handle on this serrated hunting knife is black and is made of texturized nylon. This knife is made by Buck Knives, so you know the quality is there for the price. They’ve put together a great folding knife that you can use for everyday carry and while hunting. Unlike similar looking knives with 420HC steel, Buck Knives has a distinctive heat tempering process that makes the blade on these knives nearly indestructible. That makes for a great folding knife that may easily outlast you with proper care and maintenance. It has a metal belt clip that can be removed and attached to the other side so you can wear this knife on either your right or left side. This knife is also made in the USA. Check out more of these Vantage Force Serrated Folding Knife here. At the most fundamental, a tactical knife is used for fighting and survival use while a hunting knife is used for field dressing and basic processing of game animals. While you’re unlikely to find yourself in a knife fight with a monster buck out in the forest, the combination of a tactical knife with a hunting knife can come in handy. The Border Guard 2 Tactical Rescue Knife leans more toward the tactical than hunting, but it is designed to be functional when wearing gloves which cannot be underestimated when hunting outdoors in late fall or winter. The blade measures 4 ¼ inches long and is made of 7Cr17 -a Chinese version of 440A. This type of stainless steel is commonly used as it is low cost to produce and has a right balance between corrosion resistance, edge retention, and ease of sharpening. So, even though it is Chinese, it’s still a decent enough steel that you’ve probably already used in several pocket knives and maybe even your kitchen cutlery. It is a tanto style blade, indicative of the clipped point and clipped edge that produces a sharp point suitable for stabbing. Also, this creates a differently shaped edge of the blade, consisting of a smoothed corner rather than a sweeping edge. The handle also features a seat belt cutter and glass breaker on the end. It flips out easily, even with gloves on, though it does not have an assisted open. It weighs about 10 ounces and is a bit large but comfortable to hold. See more of these Border Guard 2 Tactical Rescue Knife. Click here. This Bantum BLW Camo Hunting Knife brings all of the American made quality you’d expect from Buck Knives. It’s a folding knife that allows it to fit more comfortably in your pocket, and it comes with a removable stainless steel belt clip that can be placed on either side of the handle - making it perfect for righties and lefties. It also comes in 8 different camo patterns, including one in orange and two in pink. Of course, it is also available in plain black. The blade is 3 1/8 inches long and made of 420 HC steel. This is a high carbon steel that is similar to 420 stainless steel, but it is stronger, more resistant to corrosion, and has better edge retention. Buck Knives uses a unique method of heat treating the blades that makes this steel even more durable and wear resistant. It has a swaged drop point and an injection molded nylon handle that measures 4 3/8 inches long. The handle is also texturized and features lowered heel and forefinger groove for a more comfortable hand feel and grip. Check prices and more of the Bantum BLW Camo ﻿Hunting Knife.﻿.. These Handcrafted Damascus Hunting Knives are very unique-looking bone handle hunting knives. 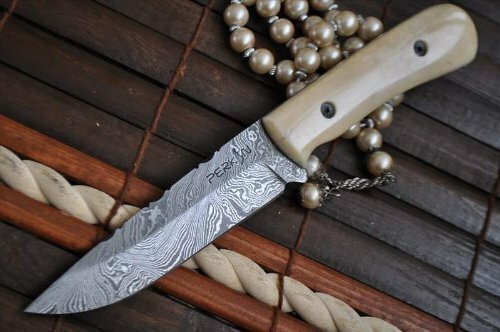 The blade is made of genuine hand-rolled Damascus steel and is 4 inches long. This is a simple hunting knife design, with a drop point and clean edge. There is some detail work along the spine of the blade; it is also a full tang for increased durability. Many people claim that Damascus steel isn’t suitable outside of a show piece, but this steel has a long reputation for being robust and durable -which is why it is still in use to this day. The wavelike pattern across the steel is caused by the folding of 1095 and 15N25 together -it is not acid etched as with fake Damascus steel. As it is genuine Damascus steel, this blade has a hardness of about 56 to 58 on the Rockwell hardness scale. 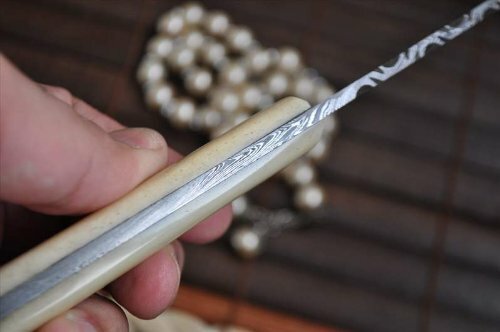 The handle is 4 inches long and is made of two bone scales along the full tang. As it is bone and not antler, the handle has a very soft and even tone, and it has been shaped and smoothed to a beautiful shine. While this isn’t a custom hunting knife, it is still handcrafted and an excellent choice if you’re looking for a more unique hunting knife. It comes with a handmade leather sheath. Check out more of these Handcrafted Damascus Hunting Knife. 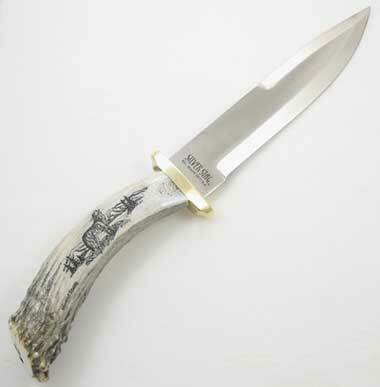 The Scrimshaw Series Antler Handle ﻿﻿Hunting Knife is a bowie style hunting knife with a shed crown antler handle from either a deer or an elk. It measures 14 inches overall, but that larger style is typical of bowie hunting knives. The blade is 8 inches long and is made of D2 tool steel that has been heat-tempered to increase the hardness to 60+ on the Rockwell hardness scale. This type of steel is sometimes referred to as a “semi-stainless” steel due to a higher chromium content. It has excellent edge retention which does make it a bit harder to sharpen. The blade has a clipped point that is swaged nearly halfway across the spine of the blade. The handle is genuine antler, and each of these antler handle hunting knives features a freehand scrimshaw design carved into the handle. Some knives feature a leaping buck while others feature a standing wolf. While the option of choosing which design isn’t there, both designs are beautiful and really give this stag handle hunting knife a one of a kind look. It has a large brass guard and comes with a hand-laced leather sheath. This knife made proudly and assembled entirely in the Pacific Northwest of the USA. 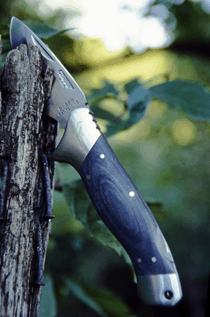 The Skinner Hunting Knife is an excellent choice for a go-to hunting knife. Overall, it measures 9.16 inches and has a blade length of 4.68 inches. The blade is a full tang and is made of 440 stainless steel. This is a popular choice of steel for knives as it has good edge retention, is durable, and is also relatively easy to sharpen. The blade has a gut hook and an upswept point to lengthen the cutting edge. These deer antler handle hunting knives are perfect for field dressing and skinning medium to large game, but it also has enough of a point to function as an all-purpose hunting knife. There is also about an inch of serration along the spine of the blade just before the handle. The handle has genuine deer antler scales with a reinforced lanyard hole in the heel. It has slight finger grooves and a dropped heel for a more comfortable fit in your hand. It weighs just over 9 ounces and comes with a leather sheath. These are great looking deer antler hunting knives that have all the features and the quality you need for hunting. 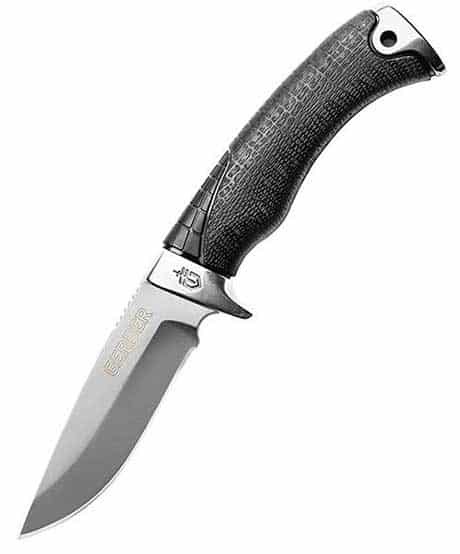 Check out prices ﻿﻿and ﻿﻿more of this Skinner Hunting Knife here. Wood handle hunting knives are a traditional favorite due to their history, durability, and appearance. The Antique Style Hunting Knife with Wooden Handle is a folding style hunting knife that is made in the form of hunting knives of bygone days. It has 3 ½ inches long blade that is made of 3Cr13 stainless steel. This steel is in the 420 stainless steel family that is common in knife making due to its low production cost and good balance among edge retention, ease of sharpening, corrosion resistance, and strength. Additional heat treating has increased the strength of this blade, with a Rockwell hardness rating of about 56. Wooden handle hunting knives typically have wood scales even on a fixed blade knife. This wooden handle knife has the scales finished off with a brass guard and pommel embossed with a floral pattern. The handle has a dropped heel and measures 4 3/8 inches when closed. It measures 7 5/8 inches overall and features a nail notch along the locking blade for easier opening. 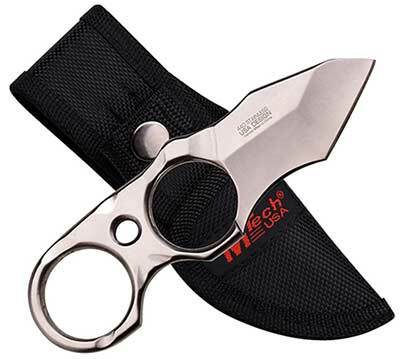 It weighs just 4.5 ounces and comes with a nylon sheath with a snap button closure and belt loop. Find out more about these Antique Style Hunting Kni﻿ves... Click here. A small hunting knife works great as a back up to your big hunting knife, but many smaller knives can hold their own as your go-to hunting knife just fine. This Compact Tanto Hunting Knife﻿ measures just 5 ¼ inches overall and has a 2 ¼ inches long blade. The entire knife is made of 440 stainless steel, which is a strong steel that has a good balance of edge retention, corrosion resistance, and durability. The blade is a tanto style, 4mm thick, with a finger choil to complement the finger groove in the handle. The handle also has two finger holes, so there are a variety of ways that this small hunting knife can be held depending upon the task. It also has a thumb rise and finger groove along the top which only increases the functionality of this compact knife for hunting. It weighs less than 2 ounces and comes with a black nylon sheath that hangs vertically from your belt and has a snap button closure. Check prices and more of these Compact Tanto Hunting Knives. This 6 Inch Skinning Knife has a relatively straightforward looking design, but closer look at the details shows just how much performance this small knife brings to the table. The blade is 2.67 inches long, but it has a sweeping edge that gives it a deep belly. This knife makes an excellent choice for skinning as a shorter blade with a convex edge provides extra length for every stroke but also works more efficiently with the way your arm naturally moves. This is a drop point blade with jimping along the spine at the point and just before the handle. The blade is full tang and made of S30V -a type of Martensitic steel that offers excellent hardness, edge retention, and corrosion resistance thanks to double tempering and a complex blend of metals. This kind of steel has excellent hardness, coming it at between 58 and 60 on the Rockwell hardness scale. This is possibly the best hunting knife steel if you’re looking for something that can really take a beating and still be ready and sharp when you need it. However, it is somewhat harder to sharpen due to that extra wear resistance and strength. This smaller hunting knife has a larger sized handle, which is unique for a blade of this size. It measures 3.65 inches. It’s made of Dymondwood, a type of stabilized wood, and has a rich wood grain pattern. There is a lanyard hole in the heel and a forefinger groove to provide a more ergonomic hold. It comes with a leather sheath with a belt loop and a snap button closure. It also comes with a Smith’s pocket knife sharpener that has both fine and course sharpeners as well as a folding honing rod. See more of these 6 Inch Skinning Knife... Click here. If you’re looking for a 12-inch hunting knife, you’d be hard-pressed to find a finer quality knife than the Apache Hunting Knife. This fixed blade knife boasts a functional design for hunting rather than just weight and heft. The blade is made of Martensitic steel -a high grade 440 stainless steel with excellent edge retention and corrosion resistance- and is the standard steel used in Muela knives. The blade measures 7 5/8 inches and has a slight trailing point with a gentle upsweep to bring out the belly. There is a slight recurve just before the guard, which gives this blade a very sleek appearance especially with the beveled edge along the spine. The handle is made of genuine red stag antler with a dropped heel and lanyard hole. It comes pre-strung with a length of leather cording that features an antler point on it. The Apache has a large brass guard to help protect your fingers. It comes with a genuine red stag leather sheath. The quality that is involved in every detail of this knife makes it a strong contender for the best Spanish hunting knife. So if you like what you see here, you may like to take a look at a few more examples of the high-quality knives Muela produces with our review of Muela Hunting Knives. The 110 Folding Hunter originally debuted in 1962 and became an instant classic in the world of best folding hunting knives. This edition has all of the same features that made the 110 a favorite: lock-back design that provides increased strength and safety, nail notch for easier opening, wood grained handle, and brass front and rear bolsters. Measuring 4 7/8 inches long when closed, this folding hunting knife has a blade measuring 3 ¾ inches long. The blade is made of 420 HC steel - a high carbon stainless steel that provides additional wear resistance and strength, as well as great corrosion resistance and edge retention. The blade has a crescent tip which provides a good sweep and thin point suitable for detail work. The handle is made of Dymondwood, a stabilized wood that still provides a beautiful wood grain appearance. The stabilized wood provides increased durability and damage resistance even when repeatedly used in wet conditions. The front and rear bolster are polished brass. This folding hunter knife weighs 7.2 ounces and comes with a black leather sheath with a belt loop and snap button closure. F﻿ind out more of these 110 Folding Hunter... Click ﻿here. As one of the best Australian made hunting knives, this Folding Hunting Knife is quite the bruiser. It measures 4 ¾ inches when closed and has 3 inches long blade. The blade has a black oxide coating and is made of 2CR13 stainless steel. This type of steel is similar to 420 and has decent hardness and corrosion resistance. It has a drop point blade and clean edge. There’s just enough width for a gentle sweep, making this an excellent all-purpose knife, hunting knife, or even a utility knife. There is also a thumb stud at the base of the blade that allows for single-handed opening. This folding hunting knife has a strong locking system, keeping this knife securely open. But it also firmly closes so you may need to pay attention consciously when closing it the first few times just to make sure you don’t get nicked. The handle is made of ABS plastic with a woodland camo pattern. This material is lightweight yet durable and impact resistant. The heel is dropped, and there are finger grooves that make this larger pocket knife feel like it was made for your hand. Click here to find prices and more of these Folding Hunting Knife. The swing blade hunting knife is a new edition to the hunting knife family and are a cross between a fixed blade and a folding knife. It has two blades that you can choose between by folding whichever blade is out down. As the blades are forged from one piece of metal, when blade folds down, the other naturally folds up out of the handle. This gives you the strength of a fixed blade knife with the convenience of two knives in one. This Swingblaze Hunting Knife has a skinning blade that measures 3.6 inches long with a drop point and slightly upsweeps for a longer cutting edge thanks to the larger belly. The other blade is a gutting blade measuring 3.2 inches long. This blade is thin and deeply concave with a dull point so you can easily cut the hide without risking damage to the internal organs or cutting the hair. The blades are made of AUS 8, a Japanese stainless steel that is very tough with good edge retention yet easy to sharpen. The handle is rubberized Kraton to provide a comfortable grip that won’t be slippery even when wet. The handle is also blazed orange, so you never have to worry about setting your knife down and not being able to find it. 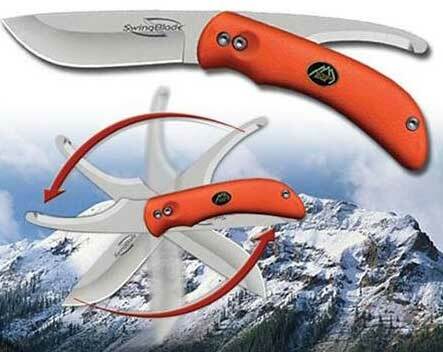 Find prices and more of these Swingblaze Hunting Knife here. The Super Bowie is a redesigned version of the SOG Bowie knife that offers improved quality and performance while still adhering to some of the traditional features that made this knife a classic. It measures 12.88 inches overall and has 7.5 inches long blade. It weighs 17.4 ounces. The blade is made of AUS 8 stainless steel. It is a Japanese developed stainless steel that offers good edge retention, excellent strength, good corrosion resistance, and all at a relatively low production cost. This blade has an added black TiNi finish that the original did not add. This finish increases the corrosion resistance, increases the life expectancy of the knife, and makes for easier maintenance. The blade has a clipped point, typical of Bowie hunting knives that are swaged - but not sharp - along most of the spine. It has a solid guard that provides a good rise to brace your thumb upon as well as to keep your forefinger from slipping forward onto the blade. The rear bolster has a lanyard hole and comes pre-strung with a length of leather cording. The handle comprises of leather washers stacked along the through tang. While this doesn’t make for the most ergonomic design, it does still provide a comfortable grip as well as traditional appearance that is getting harder to find among modern hunting knives. It comes with a black leather sheath with belt loop and snap closure. It also comes with a sharpening stone; the sheath has a dedicated pocket for the stone with a fold-over top and snap closure. The sheath does have a pair of holes at the bottom to allow for tying about your thigh. See more of these Super Bowie Hunting Knives. Click here. The Skinner Fixed Blade Hunting Knife is a great size for those who don’t want a knife that’s cumbersome but want something with a bit more presence than, say, a six-inch hunting knife. With 5 inches long blade, this full tang hunting knife comes in at about 10 inches in total length. The blade is made of D1.4 German stainless steel and has a hardness between 57 and 59 on the Rockwell hardness scale. It’s labeled as a drop point blade, but clearly has a slight trailing point with a swaged spine extending back to the jimped thumb rise. The edge is clean with just enough sweep to make this knife an excellent choice for skinning as well as general hunting use. It has a naturally shed deer antler handle with three brass rivets and a reinforced lanyard hole. The guard is polished metal in a silver color that compliments the blade, and it has a large forefinger quillon. The handle has a rounded heel for a more comfortable grip, and the bottom of the handle is slightly curved to fit the contours of your hand better. Check out more of Skinner Fixed Blade Hunting Knife here. This folding hunting knife was meticulously designed to be highly functional and offer the highest level of performance. 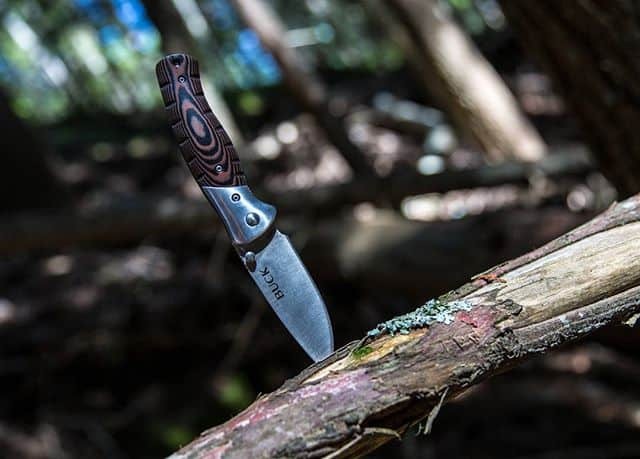 The Ken Onion Blur Folding Knife is an easy choice for the best hunting knife for under 100 dollars for us due to the amazing quality and how practical this knife is. It measures 7.9 inches overall, with a closed length of 4.5 inches. The blade measures 3.4 inches long and is made of Sandvik 14C28N steel. This variety of steel has excellent edge retention and strength, yet is easy to sharpen with good edge stability. The handle on this knife is anodized aluminum with a Tak Tek coating that provides a superior grip even in wet conditions. What really makes this hunting knife shine, however, is the care with which it was constructed so that you can easily open it one handed, and with either hand. It locks closed to protect against an accidental opening in your pocket. A small amount of pressure with your thumb on the torsion bar opens the blade and then locks it securely into place. This Speedsafe system protects against accidental closing but makes opening the blade smooth. If you’re looking for a good-quality hunting knife that will be there when you need it, but won’t cost you and arm and a leg, then we’ve got you covered with the best hunting knife for $50. This 9 inches long hunting knife has already taken quite a few people by surprise with an impressive quality for less than you would spend on delivery pizza. 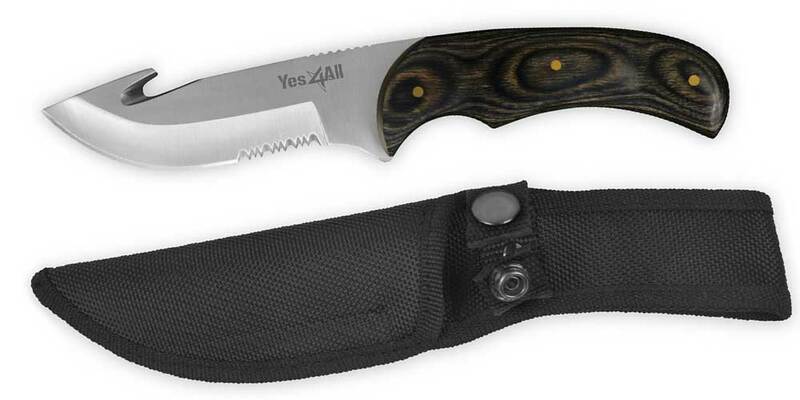 The Hunti﻿﻿ng and Skinning Survival Knife by Yes4All got our vote for best hunting knife under $50 thanks to a combination of excellent materials and design. The blade is made of 420 stainless steel. This type of steel is favored for knife blade production as, despite being inexpensive, it is also strong, has pretty decent edge holding capabilities, and you won’t have too difficult a time sharpening it. Plus, it’s got excellent corrosion resistance that will help to keep this knife looking great for many years. The blade is 4 ½ inches long which isn’t bad, but some hunters may find it a bit long for their taste. However, those who are used to a longer knife, such as a six-inch, may conclude that this is still a useful size for them. This blade features a gut hook and a slightly upswept point, giving it a deeper belly. This knife makes an excellent choice for field dressing and skinning as you’ll have that longer edge for smoother strokes. The blade edge is also serrated just before the handle, allowing you to better quarter game as you can break through the rib cage or pelvis more easily. The handle is 4 ½ inches long and made of Pakkawood. This is a stabilized wood that can hold up in wet conditions without the risk of damage that a wood handle would usually face. It has a dropped heel that better fits the natural contours of your hand and a forefinger groove that allows for a more secure use of the serrated edge. That combination of performance-minded materials made this knife an easy choice for one of the best hunting knives under $50. The search for the best hunting knives for the money can be long and arduous. For the money, the best knife has to have that combination of features and usability that make the price a true bargain -regardless of what that price is. The Laser Strike does just that. While by its first appearance it is a high-quality hunting knife, looking at the details shows just how far that quality extends into the performance. The blade is 4 ¾ inches long and 1 3/8 inches wide. It’s made of 1095 carbon steel with a black powder coating that helps to protect the blade and provide better corrosion resistance. The blade has a drop point that makes for faster sheathing and unsheathing as well as providing a sharp point. The blade also has a choil and jimping along the spine that allows for better control when doing detail work. While it has a pretty clean edge, there is just enough of a belly to make for easier skinning, yet the blade isn’t so wide that you couldn’t use this knife for skinning small game or for filleting fish. It has micarta scales which are purposely made to be removable as this hunting knife comes with tinder and flint within the handle. However, this also allows you to change out the handle easily to something that better fits your hand size or is more aesthetically pleasing that the simple canvas micarta scales. The pommel is rounded and has a lanyard hole placed low that allows you to attach a finger lanyard to increase the length of the handle for chopping wood. The overall length is 10 inches, and this knife weighs 9 ½ ounces. It comes with an ambidextrous sheath made of black kydex. This hunting knives set comes with nearly everything you need to process your next harvest, with the tools you need for field dressing all the way to deboning and packaging. The Butcher-Lite Butcher Kit is an 8-piece kit that also comes with a rib spreader, knife sharpener, nylon roll-up carrying case that can be attached to your belt in apron fashion, and game cleaning gloves. The combination of caping knife and all-purpose hunting knife has a blade 3 inches long and a drop point so it can cover all general cutting needs. The skinning knife blade measures 4 ¼ inches and has a gut hook. It also has a great upswept point that adds some depth to that belly to really make it a great choice for skinning. The boning knife has a blade 6 inches long with a thin trailing point so you can maneuver around bones to separate the meat. There is also a bone saw with a blade about 10 inches in length. Each of these knives (and the rib spreader) is made of 420 HC steel that brings all of the benefits of 420 stainless steel, only with greater strength, edge retention, and corrosion resistance. The handles are made of black rubberized kraton, with the knife handles featuring a dropped heel and forefinger groove. This choice of handle material and design ensures that these knives and the saw won’t slip out of your hand even in wet conditions. 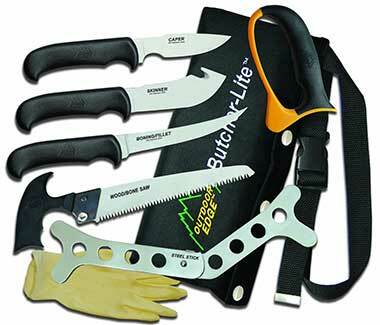 Find prices and more of these Butcher-Lite Butcher Kits here. This 5-piece Big Game hunting knife set is great as both a starter set for a beginning hunter or for a complete kit for a more experienced hunter who favors simplicity. It comes in three styles: camo that includes camouflage patterned handles and blade, black with black handles and blades, and standard with black handles and silver blades. It comes with 10 ½ inches long butcher knife with 6 inches long blade. The blade point is entirely rounded and edged. It has 9 ½ inches long hunting knife with 4 ½ inches long blade. The blade has a gut hook and clean edge. There is also a 6 ½ inches long caping knife with a 3 ¼-inches long blade that doubles as a small boning knife. There is 8 inches long honing rod with 5 inches long sharpening surface to help keep your knives razor sharp. This hunting knives set also comes with a black nylon belt sheath that holds each of the knives and the honing rod comfortably. If the previous two hunting knife kits were a bit more than you were looking for, this 2-piece Hunting Knife Ki﻿﻿t set might be just the thing. It comes with two knives that can easily handle all field dressing, skinning, and processing needs for the skilled hunter. It comes with a combination hunting and boning knife that measures 7 inches in total, with a full tang blade length of 3 ½ inches. This knife features a trailing point that allows you to cut up meat efficiently while processing but it can also easily handle any general knife use. The skinning knife measures 6 ½ inches long with a 3 7/8 inches long blade. The blade has a gut hook and a deeply concaved belly that is perfect for the natural movements you’ll make while skinning your next big game harvest. The point is swaged, but not sharp, and the rear of the blade features a finger hole for better control while skinning. Both knives are made of black 440 A high carbon stainless steel. This particular steel is pretty standard among knives as it is a right balance of edge retention, strength, ease of sharpening, and corrosion resistance. The handles are made of green camouflaged ABS that is texturized for a more secure grip. The hunting knife does have a lanyard hole while the entire set does come with a nylon sheath that holds both knives comfortably and attaches to your belt. Click here for prices and more of the 2-Piece Hunting Knife Kit. When looking for the best hunting knife for deer, you don’t need a huge hunting knife but having a little bit of length is definitely convenient. 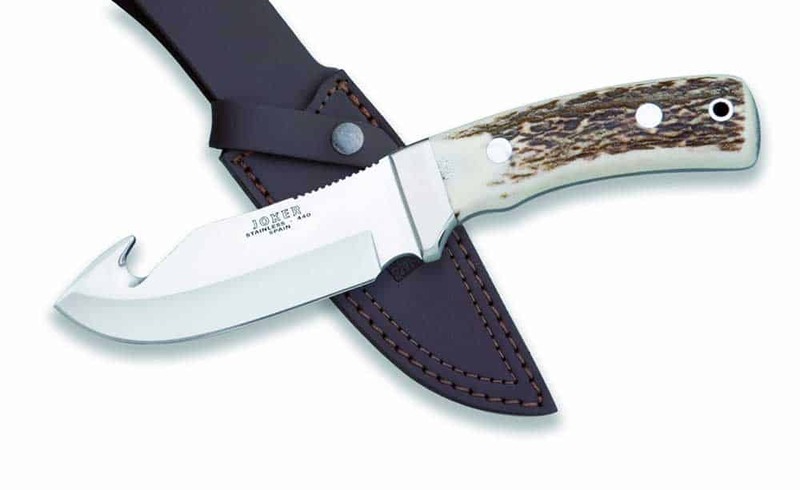 This Skinner Fixed Blade 103 deer ﻿﻿hunting ﻿﻿knife measures 8 ¼ inches overall, with a blade length of 2 ¾ inches. Before you go scoffing at that shorter blade, remember that these deer hunting knives are designed primarily to be the best hunting knife for skinning deer. That shorter blade allows for more efficient skinning and less of a chance of errant strokes. The blade has a great upsweep to the edge, giving it a deep belly that is perfect for skinning. While the point is pretty rounded, there is still enough of a should you need it. This Skinner Fixed Blade 103 Knife is a full tang knife, and the blade is made of 420 HC steel. This one is a high carbon steel that has excellent wear resistance and resistance corrosion. This blade will stay sharp long enough for you finish whatever job needs to be done and still be sharp enough to keep going. But, that means that when it does come time to sharpen this knife, it may take you a while. But, that’s the tradeoff. The handle is made of Cocobola Dymondwood - a stabilized wood with rich wood grain. The front and rear bolsters are both polished brass, and the rear bolster has a solid quillon. This is an American made hunting knife with outstanding quality and a great price, easily making it a strong contender for best deer hunting knife for the money. It comes with a leather sheath with belt loop and snap button closure. Please note that while the knife is made in Port Falls, Idaho, the sheath is made in Mexico. One of the big things that sets apart elk hunting knives from other hunting knives is that the knife will be designed to allow you to field dress, skin, and quarter quickly the animal so you can more easily bring in your harvest. The Blood Moon Hunting Knife is a bowie style knife, measuring 11 ½ inches overall with a 7 inches long blade. The blade has a trailing point, while many bowie knives feature a clipped point. But this allows for a greater sweep on the blade edge -making it more efficient for skinning. The spine is serrated to allow you to crack the pelvis and rib cage more easily with this elk hunting knife. The blade also features a full tang with large forefinger choil, jimped thumb rise, and jimped thumb groove. This knife makes this the best hunting knife for elk as you can securely grip the knife in a variety of positions depending upon what the job you’re doing requires. The handle has natural wood scales, a slight forefinger groove, and a lanyard hole. There are four additional tie-down holes along the choil that allow this knife to be converted to a bayonet or spear. It comes with a nylon sheath. Find out more of these Blood Moon Hunting Knives here. When you’re looking for the best knife for pig hunting, you usually end up having to narrow your choices down by features and figuring out which knife can get the job done. But the Wild Pig﻿﻿ ﻿﻿Hunter hunting knife has made the process easier with a knife specifically designed for pig hunting. Partly based off of the style of a Russian fighting knife, this pig hunting knife measures 13 inches overall and has 7 ½ inches long blade. While it’s not necessarily a huge hunting knife, it is still a long hunting knife that some may find a bit more knife than they need. However, that extra length is what makes it perfect for pig hunting. The blade is made of 1095 stainless steel. This type of steel is relatively inexpensive and can be sharpened to a razor’s edge with ease. It has a clean edge with an unsharpened swaged spine that gives it an almost spear-like point. It is a full tang blade and is a beasty ¼ of an inch thick. The blade has a Black River Wash finish. 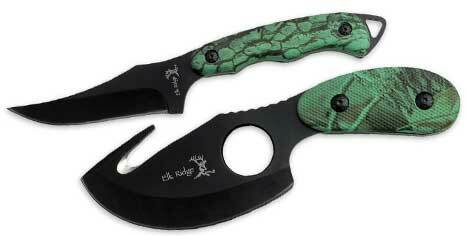 The handle is comprised of two green canvas micarta scales with a lanyard hole in the heel. It has a Rocky Mountain tread pattern for a textured grip as well as finger grooves. The handle is 5 ½ inches long and comes pre-strung with a length of paracord. This is a big hunting knife but not so big as to be cumbersome. It can easily double as a survival knife thanks to its larger size and heft. This B﻿﻿ird & Trou﻿﻿t Hunting Knife was a natural choice for the best knife for duck hunting due to its gorgeous design and workhorse performance. The lines and coloring of this knife are sure to make it the envy of your hunting group. But make no mistake, this knife is built for continuous high performance and longevity. It measures 8 inches in total length and has 4 inches long blade. That blade is made of D2 steel, a semi-stainless steel that has excellent edge retention and good resistance to corrosion. While it takes a bit more work to sharpen, this metal polishes up nicely -as seen in the near mirror finish on this blade. It has a clipped point and good belly with a thick spine, making it a perfect duck hunting knife. 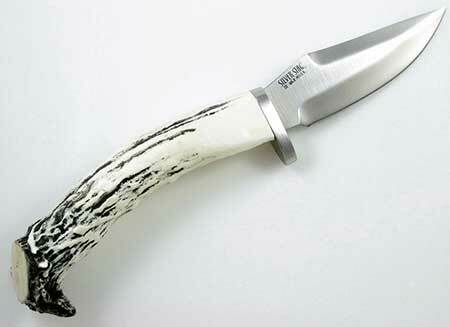 The handle is made of genuine shed crown antler, either from a deer or elk. It has a decent sized guard to keep your forefinger from slipping forward and comes with a handmade leather sheath with a belt loop. The sheath is lacking a strap or snap closure to maintain the knife securely in the sheath, so while the quality is good, the design may leave you looking for a replacement sheath. Find out more about the Bird & Trout Hunting Knife... Click here. A hunting knife with gut hook can make the difference for your hunting season with the added convenience that this simple feature brings. This knife measures 7 ¾ inches overall with a full tang blade length of 3 ¼ inches. The blade is made of 420 HC steel. This is a high carbon stainless steel that combines the corrosion resistance of high chromium stainless steel with better wear resistance thanks to the higher carbon amount. The Omni Hunter Guthook Knife makes for a tough blade that holds and edge well but may be more difficult to sharpen. The blade has an upswept point that deepens the belly to provide an excellent edge for skinning. The handle on this gut hook hunting knife is coated in alcryn rubber that allows for a firm yet comfortable grip. This comfort is increased by the dropped heel, recessed forefinger groove, and texturized edges. There is a lanyard hole in the heel. This knife is available in black, orange camo, and real tree camo. It’s also got a great price point and is made by one of the best knife manufacturers in the world. It weighs just 4.6 ounces and comes with a nylon sheath. This is a great American made hunting knife that will provide years of faithful service. With so many hunting knife makers and custom knife makers throughout the world, finding the best hunting knife brand can be quite the challenge. While we’ll take a look at individual hunting knives and the performance they have to offer later on, for now, we want to give you a little history behind some of the best hunting knives brands. Of course, this list isn’t the be-all and end-all of hunting knives brands. However, it will give you an idea of the level of commitment that goes into producing the best hunting knives and will show you that a good hunting knife can come from a company that’s been in business for over a hundred years just as easily as it can from a company just 30 years old. With over 110 years of continuous knife making history, Buck Knives was born when Hoyt Buck developed a new way to temper steel so that it would an edge longer. He produced his first knife in 1902, using old files to create a high quality hunting knife. In 1945, he and his son went into business as H.H. Buck and Son. Buck Knives was officially incorporated in 1961 and completely changed the knife making industry with their revolutionary Model 110 Folding Hunter. This was the first folding lock-blade knife and seated Buck Knives position as one of the best hunting knife manufacturers in the world. Today, the tradition of innovative ideas and designs continues, with Buck Knives producing a range of various knife designs and styles suitable for hunting, recreation, fishing, survivals, and cutlery use. In addition to their custom made hunting knives, many of their products are both customizable and are personalized hunting knives. Based in Bradford, Pennsylvania, W.R. Case & Sons began in 1889 when four brothers began making quality knives and selling them along a wagon trail to would-be pioneers headed out West. The company was incorporated at the turn of the 20th century thanks to Russell Case, the son of W.R. Case and one of the original four brothers. Together, they laid the foundation for a company that quickly became known not only for producing high-quality knives, but also for being dependable. Today, the company is owned by Zippo Manufacturing Company, yet it continues to produce the same outstanding knives that have earned Case the reputation of being one of the top hunting knife brands. Their knives are a favorite among collectors, thanks to the pioneer spirit that exists in their knife designs, the large variety of handle materials available, and the attention to detail exhibited in every knife. In fact, it takes 125 pairs of hands to complete just one knife, giving you an idea of the amount of craftsmanship and effort that goes into every single Case knife. 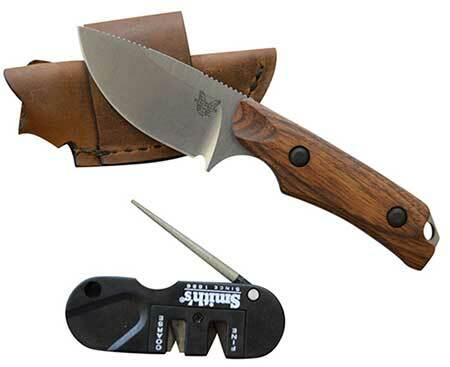 Although lacking the breadth of history some of the other hunting knife brands on this list have, Benchmade exhibits the American spirit in its commitment to producing quality hunting knives and determination to keep going despite obstacles. Benchmade was founded on the desire to use the latest in technological advances both material and techniques to produce high-quality knives that you can count on when you need them most. Based in Oregon City, Oregon, Benchmade knives are one of the few hunting knife brands that are both designed and manufactured in the USA. They revolutionized manufacturing processes to allow for more custom knife designs. They were also the first company to own and use a high-power laser cutter that enabled them to begin using metals that are too hard to stamp. This was what helped them establish themselves as one of the world’s leaders in automatic knife manufacturing. 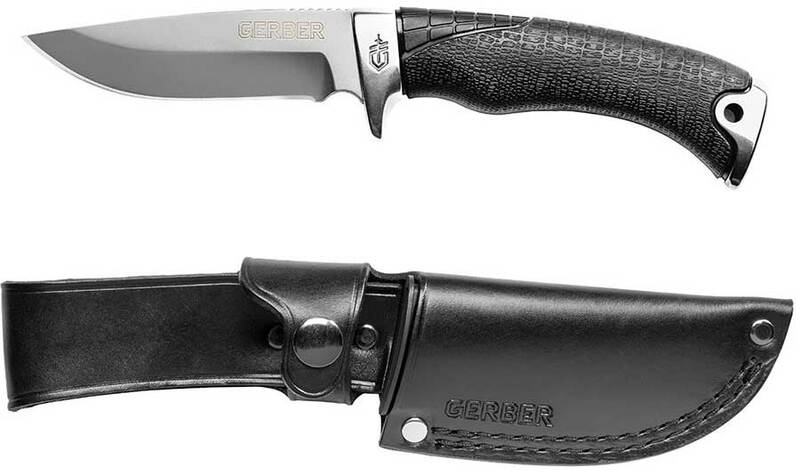 Created by Joseph R. Gerber in 1939, Gerber Legendary Blades quickly grew from a company producing small batches of handmade knives into one of the leading and most trusted hunting knife brands. Based in Portland, Oregon, Gerber remains committed to producing functional and affordable knives. Each of their knives is designed and engineered at their base of operations in Oregon, and many of their knives are also produced there. However, to keep up with the demand for affordable yet quality hunting knives, Gerber does outsource some production to make their lifetime warranty backed products available to everyone. In addition to hunting knives and machetes, Gerber has expanded their product offering to now include a broad range of products to support the outdoor enthusiast, including survival kits, digging implements, and handsaws. Hunting knives come in a variety of different designs and styles. While there are some general hunting knife designs, it’s not uncommon to come across a hunting knife that features some elements common to more than one style. Different hunting knife designs reflect the specified use of what the knife is for. As you’ll see in the list below and later on in our hunting knife review, a small change in the blade shape and sweep can make a hunting knife better suited for skinning or better for quartering animals. So, the best hunting knife design will vary depending on what you plan on using the knife for, as well as your preference. An all-purpose hunting knife will have a shorter blade, with most being around four to six inches. The blade tends to have a drop point, meaning that the point of the blade curves down slightly so that it is lower than the spine of the blade. This creates a strong point that won’t get in the way too much while skinning and also allows you to sheathe and unsheathe this blade very quickly. The blade edge will generally be straight but may feature a slight upsweep, giving it a slightly larger belly that also makes the knife better suited for skinning. The quintessential wilderness knife, this style of blade tends to be larger, usually between six and twelve inches. It will very likely feature a clipped point, with the point of the blade lower than the spine due to part of the blade being cut off. That clipped point is frequently concave and may or may not be swaged (i.e. sharpened.) Some Bowie knives will also feature serration along the spine of the blade. There aren’t any specific requirements for a knife to be considered a bowie knife, but most commonly these knives resemble knives from the 1800’s, are heavier, and larger. Modern renditions typically feature the clipped point and a straight edge. When looking at a caping knife blade, there are two styles. The first is actually a skinning knife while the second is a real caping knife. The caping blade, about three inches in length, is thin to slide beneath the hide and gently separate it from the animal. It frequently has a finger groove and thumb groove at the end of the blade right before the handle, creating a narrow neck appearance. This design allows you to maneuver the blade better across the shoulders of the animal without tearing the hide. The Gut Hook is truly more of a feature on a knife blade but treated commonly as its own design style. A gut hook is found on the spine of the blade, usually nearer to the point. It is a small rounded and sharpened notch in the spine. It allows you to gut better or field dress an animal by sliding beneath the skin and cutting it -yet without risking damage to the internal organs. Hunting knife blades featuring a gut hook are frequently skinning blades, with an upswept point and deep belly. Like the gut hook, serration isn’t so much a blade style as it is a feature that improves the performance of the knife per certain tasks. On a hunting knife blade, the serration will frequently be on the spine of the blade, often near the handle, or on the blade edge, also nearer to the handle. While this does give the blade a cool Rambo hunting knife look, it’s useful for opening up the rib cage and splitting the pelvis of large game animals. This can be incredibly useful while hunting elk and needing to quarter your trophy to bring it in out of the wilderness. These blades are short, with a good skinning blade about 3 1/2 to 3 7/8 inches long -never more than four inches. The blade will be fat, with an upswept point and deep belly that allows for longer strokes on the short blade. This deep belly also better coordinates with the natural movements you make while skinning, allowing you to work more efficiently and with less risk of damaging the hide. A trapper’s knife is the ultimate hunting knife for skinning. It features the deeper belly of a regular skinning knife; only the point is entirely gone. Rather, it has a rounded end that makes it virtually impossible to poke through the hide. It’s important to note that there is a style of folding knife commonly called a trapper’s knife. It features two blades, one a standard, clip point, pocket knife kind of blade, the other featuring a steep drop point that provides a rounded point, but there is still an obvious sharp point on the end of this blade. Steel is the most commonly used material for a hunting knife blade. However, different types of steel are made by varying the proportions of carbon and iron, as well as altering the production process and adding other metals to the alloy. The result is that each of these metals will differ in terms of strength, corrosion resistance, edge retention, and how easy it is to sharpen. Strength is frequently determined using the Rockwell Hardness Scale which assigns a number to the metal that lets you know how well it can hold up under stress. Identifying the best hunting knife blade steel is not an easy task. For example, when the hardness or strength of a steel goes up, it also becomes more brittle. However, a softer steel that is less brittle (and less likely to chip or warp during heavy use) is less likely to hold an edge. That means it will need more frequent sharpening which will impact the life expectancy of the blade. So, determining the best hunting knife blade material is more so a matter of looking at what best suits the task at hand. It’s important to remember that the tempering process can also affect the performance of the knife blade. So, two knives with the same steel type for the blades, yet the blades underwent different heat treating, will differ in terms of performance. Often, too, manufacturers will apply a coating to the blade of the knife to offset corrosion and increase the life expectancy in lower quality steel - resulting in a more affordable blade that can still offer excellent performance. Hunting knife blade material falls into three categories: tool steel, carbon steel, and stainless steel. Tool steel tends to be harder and more durable. Carbon steel is commonly used for hunting knife blades as it is strong, able to take a beating, and holds an edge well. However, it is more susceptible to corrosion if it’s not treated, so you may want to keep the blade lightly lubricated to help prevent corrosion. When looking at the best hunting knives review below, you’ll notice that there are a surprising number of different materials that can be used to make a knife handle. What type of material you look for in a knife is more than just aesthetic in nature, as the material used can determine the suitability of the knife to certain tasks. In other words: the handle material does affect the performance of the knife just as the blade material does. Although to be fair, an inferior handle can always be replaced with a high-quality blade -the same cannot be said in reverse! The best hunting knife handle material will vary depending on how you plan to use your knife. If you do a lot of hunting during the winter, you may want to choose a material that warms quickly, such as wood, Kraton, or micarta. If you hunt where it’s pretty humid, then a handle material that can withstand the humidity and won’t slip in your hand would be a better choice, such as G-10, Kraton, or Zytel. While this is in no way an exhaustive list of materials that can be used for a hunting knife handle, this list will give you an idea of what types of materials are available and what you may want to look for. You’ll find natural, metal, and synthetic materials listed with a look at some of the pros and cons of each. What hunting knife review would be complete without a few hunting knife sharpener reviews? We’ve covered how to sharpen a knife earlier. So now we’ve got a few of the best hunting knife sharpeners for you to consider. Every knife will eventually need to be sharpened and honed. It’s better to be prepared with the sharpest hunting knife all the time than to find yourself with a dull knife when you need it most. These knife sharpeners are each of different styles, to give you a better idea of what’s available. They’re arranged from the simplest to use to the most complex. This Professional Knife Sharpening System is a table top model that allows you to pass the blade through, sharpening your knife in just a few strokes. 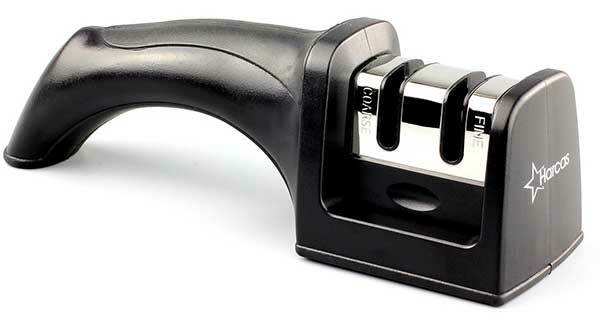 While it is widely modeled as a kitchen knife sharpener, the stable base allows this sharpener to be used to sharpen even large hunting knives. There are two stages to this hunting knife sharpener. The inside sharpener is the course sharpener, with tungsten carbide blades to smooth down burrs and small nicks in the blade edge. The fine sharpener contains ceramic rods to hone the blade to razor sharpness and remove any remaining burrs. The combination, beginning by running your knife through the course side a few times and then through the fine sharpener, removes burrs and small nicks and gives you a clean, sharp edge. This is an entirely manual sharpener that is similar to the small handheld knife sharpeners that the hunting outlet stores give away at the start of deer season. Check out more of this Professional Knife Sharpening System. This is a ceramic style whetstone that combines the efficacy of the course grain side of Fallkniven’s DC4 with a fine ceramic stone to help you achieve that razor sharp edge. The C﻿﻿er﻿﻿amic Whets﻿﻿tone is a dry whetstone, which means that lubrication with water or oil isn’t necessary. However, you will need to clean it after every use to keep it free of debris and at top performance. The course side is dark grey and contains synthetic sapphires to provide initial sharpening. Then, flip the stone over to the white ceramic side for fine sharpening and honing. A whetstone is a favored choice for the best hunting knife sharpener due to not only its traditional use but how simple and efficient a whetstone is. 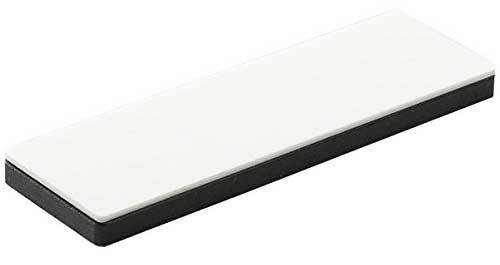 This whetstone measures 1.25 inches by 3.9 inches and weighs about 1.8 ounces. It comes with a leather pouch and can be easily carried along with you in your hunting bag or a pocket. This is a more complicated knife sharpening system that is an excellent choice for those who want perfection and don’t mind hard work. 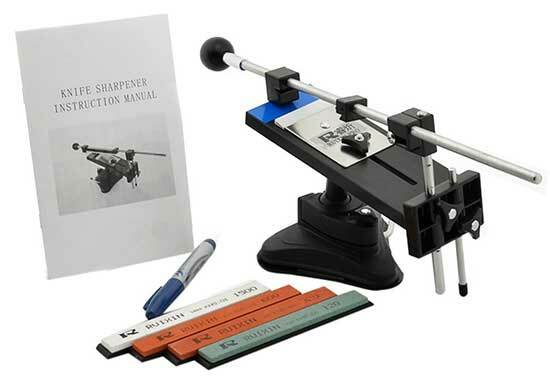 The Deluxe 5-stone Sharpening System comes with five sharpening stones of various grains, along with guide rails, a professional knife clamp, storage case, and honing oil. The completeness of this kit makes it the best hunting knife sharpening system, especially as it is indeed designed with convenience in mind. For example, each of the sharpening stones is color coded, so you can easily tell what grain they are at a glance, and they have finger grooves for a secure grip. The sharpening stones included are extra fine ceramic, fine alumina oxide, medium, course, and an extra course. This means that you’ll have everything you need to sharpen even the dullest knife that you’ve had rolling around the bed of your truck all winter. The guide rails can help you maintain an angle of 17, 20, 25, or 30 degrees so you can get just the right edge of your blade. Instructions for use are included so you can get started right away with your hunting knife sharpening. Check out ﻿﻿Deluxe 5-Stone Sharpening System here. The Professional Knife Sharpening System comes with a fixed angle sharpening frame that has a suction base. This base allows it to remain in place as it grips onto your kitchen counter or table, allowing you to work more comfortably. The frame is designed to protect your hands from both the blade that you’re sharpening and from the grit of the stones. This frame is made of plastic and stainless steel and requires some simple assembly to get started. 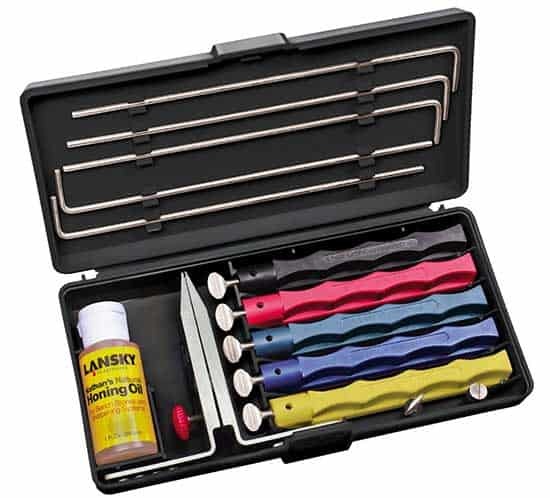 Also included are four sharpening stones, color-coded, so you can easily switch between them. The coarseness varies from 120, 320, 600, and 1500. A pen is also included so you can mark the edge of the blade of your hunting knife to help you more easily hold to the desired angle. Complete instructions for use are included, though, admittedly, this is a knife sharpening system that will require a bit more patience and practice in order to use properly. Click here to see more of these Professional Knife Sharpening System. Which is the Best Hunting Knife? There are a lot of features and styles to choose from when trying to find the perfect hunting knife. We have tackled some of the best made hunting knives in the world. But don’t let the amount of information we covered overwhelm you! Finding the best hunting knife is not as difficult as it may seem. As we saw from looking at the different blade designs, how you intend to use your knife is the most important deciding factor. If you primarily go deer hunting, like to handle the skinning on your own, but send the meat off to be processed, then an all-purpose hunting knife with a four-inch blade will do you just fine. If you’ve got a lot of experience field dressing, then a skinning knife with a gut hook may be perfect for you. Your choice of handle material and blade steel may be limited based upon your price range, but even a “low quality” material can turn out to be incredibly durable and more than enough for what you need. And that, above all, is the most important part in choosing the best hunting knife: focus on what you need and which hunting knife can provide that. "...the best fixed blade hunting knife for heavy tasks as you can work comfortably with it barehanded or with gloves..."
In a hurry? Take a look at the Best Hunting Knife to Buy in USA! "...a very durable blade and has excellent edge retention, it is harder to sharpen than a softer steel..."